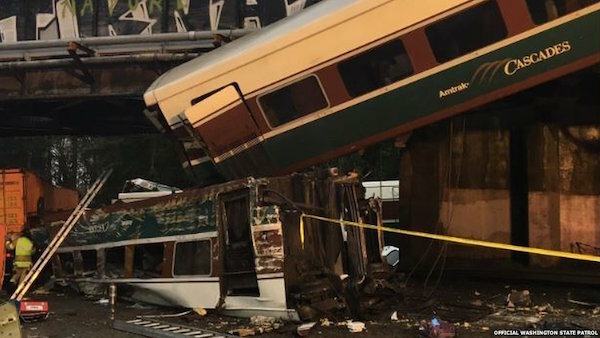 The train derailed about 40 miles (64 kilometers) south of Seattle before 8 a.m.
Amtrak says there were approximately 78 passengers and five crew members on board. Ed Troyer, a spokesman with the Pierce County Sheriff’s office, said multiple people were killed aboard the train that was heading south, but no numbers were immediately available. The sheriff’s office said several vehicles on Interstate 5 were struck by the falling train cars and “multiple motorists” were injured on the roadways. No fatalities of motorists were reported. Chris Karnes was on the train, three or four cars back from the front. “I’m not sure what got hit. I’m not sure what happened,” Karnes said. He was unhurt but near the medical tents set up in a median area between north- and sound-bound I-5, just south of DuPont. “The only car that is on the tracks is the rear locomotive. There are several cars that are hanging over the overpass,” Karnes said. In a statement Amtrak said the train that derailed was Train 501, offering service from Seattle to Portland. “Emergency services are on the scene and Amtrak management is responding. Some injuries are reported,” Amtrak said.